At night time I used to be so lazy and simply swipe my face with a baby wipe hoping it would rid my face of the makeup I’d worn throughout the day. I think my laziness stemmed from never suffering from terrible spot outbreaks but I soon came to realise that taking makeup off properly is as important as brushing your teeth. Although my skin wasn’t terrible it did sometimes look dull and I would have a few blackheads that would never leave. Now I am 24 I am glad that I saw the light before it was too late and now I take good care of my skin morning and night with the hope I don’t age prematurely. Before I list the products I use before bed I must say that I drink a lot of green tea and try to drink a fair bit of water throughout the day which are both fantastic for your skin. Just remember we need a great base before we apply makeup and so taking it off correctly, drinking a lot of fluids and eating well definitely helps with that. 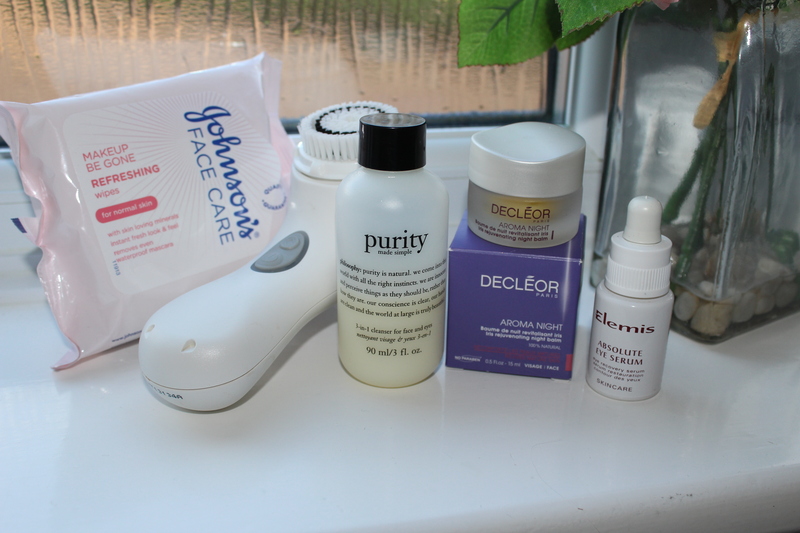 I do mix up my skincare routines now and again but these are the night time products I am using at the moment. 1) First of all I pick up a makeup wipe and take off as much of the visible makeup as possible. I bought these ‘Makeup Be Gone’ ones from Johnson’s in Boots and they were 3 for £5 at the time which I thought was a bargain (RRP £3.29 for 25 wipes). These wipes are brilliant, they leave your skin feeling really soft and even take waterproof mascara off with ease. 2) I then dampen my face and my Clarisonic Mia 2* (RRP £125). I then drizzle Philosophy’s ‘Purity’ 3-in-1 cleanser* (RRP £8-£28) on the head of the Clarisonic and clean my face for 60 seconds. I then take a wet flannel and wipe the remaining cleanser off my face and clean my eyes too. Here’s my review on the Clarisonic Mia 2 http://www.youtube.com/watch?v=XMKa_LgBnhc – Its like a giant toothbrush for your face and I just love it as it gives you a complete deep clean. Philosophy’s ‘Purity’ 3-in-1 cleanser removes makeup, tones and lightly hydrates your skin so is great for night time when you may feel a bit lazy not to tone and moisturise. I’ve been loving this cleanser as it just makes your skin feel extremely clean and instantly soft. A little bit of product goes a long way so will last a while. 3) Once I’ve dried my face I will apply a small amount of Decleor ‘Aroma Night’ balm* (RRP £32.50). Inside the box it comes in you will find a small spatular which helps ensure you don’t apply too much product. I warm the product up with my hands and then swipe it over my face. This gives off an amazing spa like aroma which instantly helps you relax ready for a good nights sleep. As this is a balm I was a little hesitant to use it as thought it may make me a bit spotty but it is a brilliant product for just before bed and soothes the skin. 4) Finally I will apply Elemis ‘Absolute Eye’ Serum to the contours of my eyes (RRP £28 but the link I’ve included sells it for £22.40). This product is one to use at night time as it is a serum which takes a long time to dry and goes a little bit sticky after a while so you wouldn’t be able to use this in the morning before makeup. It helps to fight the ageing process and with dark circles. It has a variety of herbal extracts to help relieve stressed and tired eyes. After I have completed my skincare routine I will chill out in bed for an hour or so by watching some television (which is not always the best way to relax) and then drink some water and drift off into dreamland.